Today we take a look at the Azan Burgundy Short Campana, from Roberto Duran Cigars. Sized at 4 3/8" x 46 this Burgundy may be small, but don't let that fool you, it's crammed full of big flavors. Let's take a look at the flavors first. Testing cold aromas, from the foot, there were notes of wheat straw and the free cold draw tasted like sweet over ripe tree fruit. Once the Azan Burgundy was burning ,the initial mild bodied flavor mix was oak, white pepper and caramel. It was nice, but that's just the beginning. Soon to follow were notes of sweet cream, sugar, toast leather and brown sugar, all of this took place in the first inch. 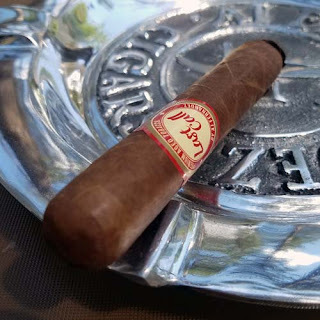 As it burned on, the sweet cream with sugar came back plus other nuances of, sweet tea, nuts and earth The cigar finished with a medium bodied mix of sweet cream and mild black pepper. Looking back at the construction, this little stick was well put together. The claro colored wrapper was seamless, nearly vein free and it was packed tightly from head to foot. At thirty-five minutes,smoking time was a bit shorter than expected, but in the acceptable range, and the burn line was razor sharp full length. Overall, the Azan Burgundy Short Campana was a fantastic stick with it's complex mix of flavors, top-notch construction and a price right around $4.00. These still might be bit hard to track down, but if you find one, don't pass it up! I would like to thank Gabriel Piñeres of www.creativasgroup.com for hooking me up with these samples.